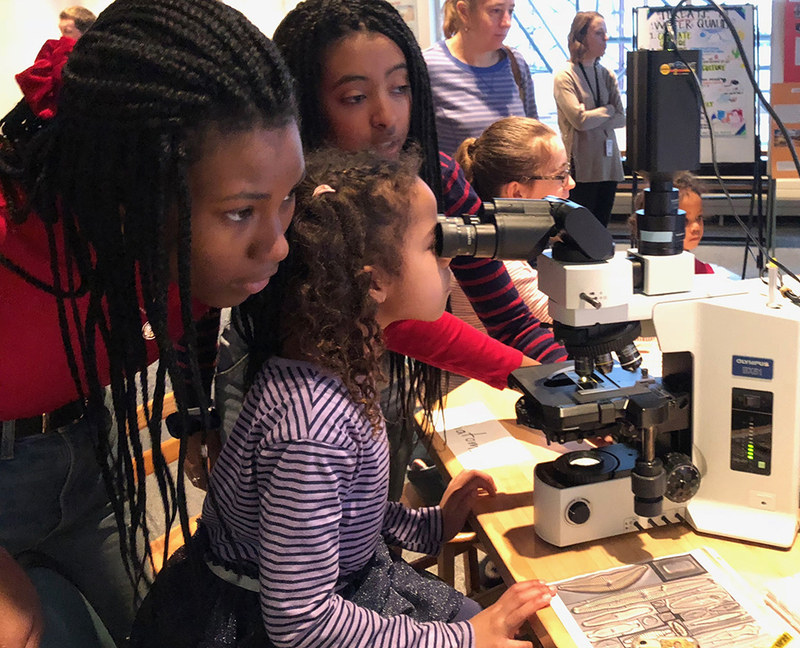 On Martin Luther King Jr. Day, the Science Museum of Minnesota offered visitors the opportunity to think critically about water quality and its impact on society. With the help of scientists from the St. Croix Watershed Research Station and students from the Kitty Anderson Youth Science Center (KAYSC), visitors were able to engage with the science of water chemistry and biology by testing water samples collected from all over the nation. Visitors from age 4 to 94 tested waters from the nearby Mississippi River and metropolitan lakes and streams, the Colorado River, and the Gulf of Mexico for chloride, chlorophyll, transparency, and nitrates. 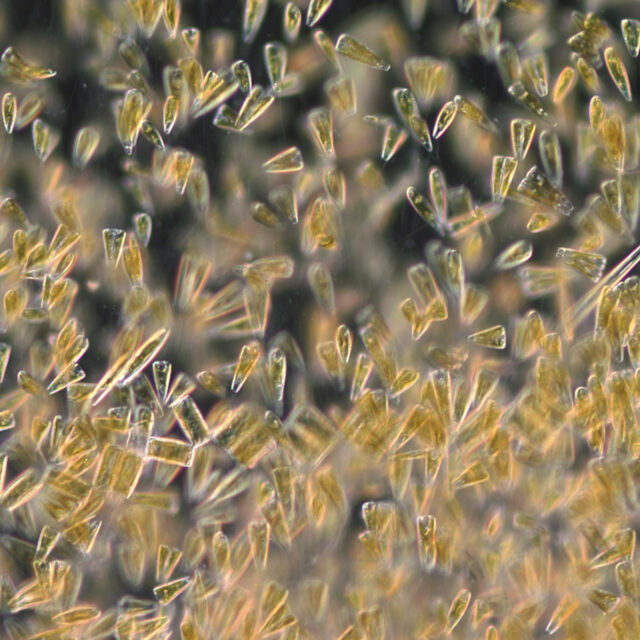 They then compared their measurements to state and federal standards, and spent time using a research microscope to look at algae, especially diatoms, growing under the ice. While the scientists were on hand to coordinate the activities, it was a group of high school students who taught visitors how to analyze water quality and interpret the resulting data. The youth are part of the KAYSC, a museum program that uses out-of-school activities and employment to expose untapped students to STEM fields, community service, as well as develop leadership skills in the name of career development. A week before the event, the youth learned about water quality and standards, discussed how water quality affects everyone’s life, and were trained how to measure and interpret water quality data. At the event, the KAYSC students guided kids and families through the steps of water quality testing and microscope analysis of diatoms. Data were plotted, which showed several stream samples exceeded Minnesota’s chloride and federal nitrate standards. 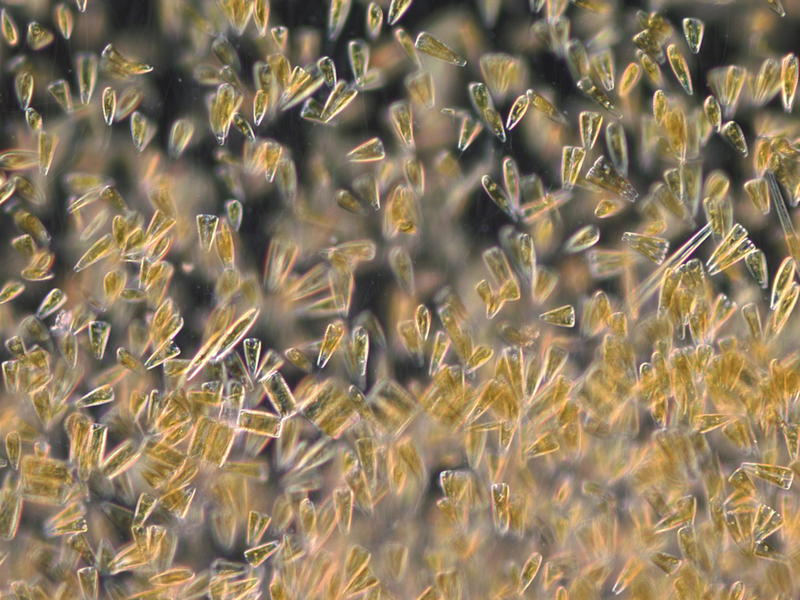 Stream periphyton was dominated by mucilaginous Gomphoneis colonies, while under-ice lake plankton had abundant Asterionella formosa, Fragilaria crotonensis, and surprisingly, the noxious bloom-forming cyanobacterium Aphanizomenon flos-aquae. Students in the KAYSC program taught visitors how to measure water quality..
Gobs of Gomphs dominated the stream periphyton.